Speed of Play – the acceptable standard is 3 1/2 hours for a four-ball game. Please keep pace. Always be ready to play your shot. Mark your scorecard on the next tee. 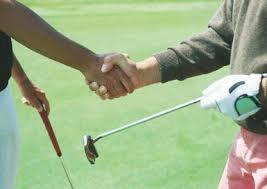 Replace divots, repair ball marks on the greens (not just your own) and rake the bunker after playing your shot. Players are required to defer to the competition of the day. Two-balls have priority over three-balls and four-balls. Four-balls have priority over three-balls. Those starting other than from the 1st tee have no standing on the course and should give way at all times. Practising is not permitted from any tee. Practice with a “metal wood” club is permitted from the first cut of rough. Practice with an iron is permitted only on the Practice Ground or from the first cut of rough. No iron shots may be practised on to any green. Practice chipping on to greens is permitted from the back of any green. Practice from a bunker is only permitted from the bunkers on the Practice Ground. No practising whatsoever is permitted on the 18th hole. This is reserved for the Professional in his teaching capacity. Trolleys should not be taken between bunkers and greens. Power Trolleys – in winter or very wet conditions there may be occasions when, while the course is open for play, electric trolleys will not be permitted. 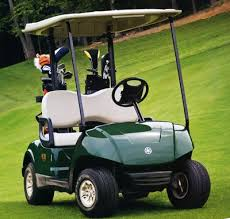 Buggies – please observe the guidelines displayed inside these vehicles and the signs on the course.